On Saturday, October 6, the Community Center for the Performing Arts and University of Oregon Campus Radio 88.1 FM KWVA proudly welcome Scotland’s We Were Promised Jetpacks backs to the WOW Hall along with Eugene’s own Girls Punch Bears. 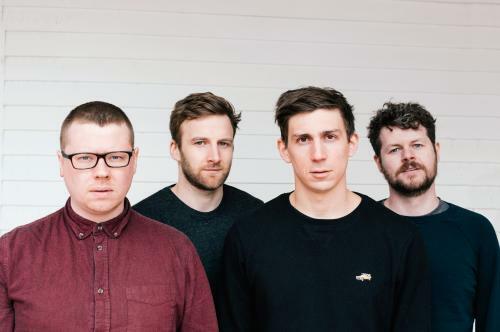 Scottish rock mainstays We Were Promised Jetpacks (Darren Lackie – drums; Michael Palmer – guitar; Sean Smith – bass; Adam Thompson – vocals, guitar) have announced their signing to revered boutique record label Big Scary Monsters in Europe. They have self-released their new album The More I Sleep, The Less I Dream in North America and are presently on an extensive tour in the U.S. through October. Having spent ten years almost consistently writing and touring, WWPJ reverted back to their original four members and dealt with several behind the scenes changes. They celebrated a few marriages and tried to remember who they were when not on the road. Now the acclaimed group have returned and are ready to embark on their first huge headline tour in a number of years. After the musicians finished touring 2014’s Unravelling, they decamped home to Scotland and took a breath. A decision was made. No more touring until a new album had been written. It wasn’t until early 2018 that they finally felt they had a collection of songs they were proud of. But only after taking a few wrong turns along the way. “We scrapped probably a full album,” Adam adds. “Something just felt off about them. They didn’t work at all.” So instead of focusing on external expectations, they decided to write for themselves. To write songs that made them happy. “The More I Sleep, The Less I Dream” was one of the first songs to help shift the band in the right direction. It didn’t take long to write with all members quickly connecting with its darker vibe. From there, they focused on making sure each song was fully realized before even thinking about studios or recording. After meeting up regularly and writing constantly at their rehearsal space in Leith, Edinburgh for two years, the band made sure they knew all of their songs inside out. Every single detail of everyone’s parts poured over, refined, built on. The musicians connected with producer Jonathan Low (The National, Sufjan Stevens, Kurt Vile, The War on Drugs) and were inspired by his approach to their vision and his grounded style. After making their prior albums in England, Scotland and Iceland, it felt like a good opportunity to try crafting songs in the U.S. The album was recorded over the course of five weeks at Minor Street in Philadelphia and Long Pond in New York’s Hudson Valley in early 2018. The preparation turned out to be essential, helping the musicians keep each song simple and minimal. “Jon was totally onboard with us only adding things that underlined what we wrote together in the rehearsal space. We wanted it to sound like it was alive and he really helped us realize that,” Adam says. Lyrically, The More I Sleep, The Less I Dream reflects a group of people who have grown up since they first emerged on the scene with These Four Walls in 2009. Concepts of miscommunication and self-doubt thread throughout the songs, beginning with the surge of the album’s opening track “Impossible”, carrying through to the emotionally wrought, slow-burner “Hanging In”, and onwards to the relentless drive of “Repeating Patterns” and the menacing closer “The More I Sleep, The Less I Dream”. The More I Sleep, The Less I Dream marks a new chapter in We Were Promised Jetpacks’ career. It’s about going back to the heart of who they are, a high school band that never stopped. It’s about four people who have grown up together, making a conscious choice to keep writing music and seeing where that takes them. The More I Sleep, The Less I Dream contains the essence of what the band have grown into, both as artists and as people. They’ve taken their experiences, both from their ten years as a touring band and from the changes in their personal lives, and forged them into an album that represents a new phase for the band. The term “punk” has over time become less a descriptor of a certain music’s sound, and more a descriptor of its’ attitude. Eugene based ensemble Girls Punch Bears exemplify a true punk attitude and angst through and through. Sonically, the band draws aesthetics from a multitude of genres; including everything from the faintest touch of 90s pop punk and jazz to more current renditions of fuzzy, lofi, garage-indie-rock. While it may be difficult to pin a single genre to their music, the thread that ties Girls Punch Bears’ work together is their conviction. The band’s uninhibited and biting lyricism pairs all too well with vocalist iLee Jo’s distinct voice - which is both sweet and commanding all at once. From their softest moments to their thrashiest moments, Girls Punch Bears employ an unmistakable and unashamed honesty that is sure to evoke passion from even the most lethargic of listeners.